During work hours, it’s your job to monitor user content on your brand pages in accordance with your brand guidelines and social media policy. When you’re off the clock, SocialSitter monitors the content for you. 2. Our team checks the update and categorizes it for your review and action. 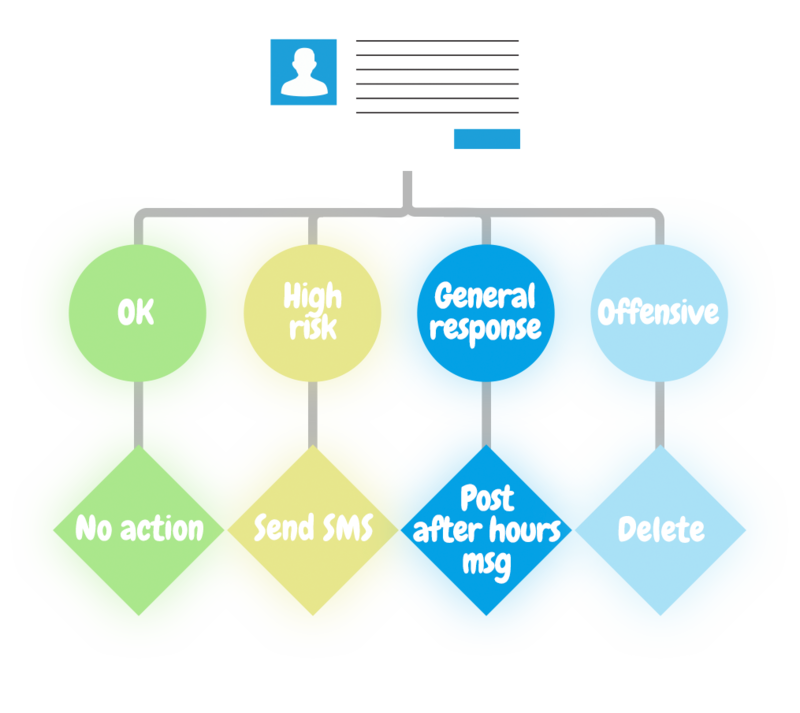 High risk content will be flagged for your immediate review, and you will be alerted by SMS within 15 minutes of anything appearing on your page. Other content is categorized as “OK” (no action taken), “General response” (an after hours message is posted - coming soon! ), or “Offensive” (content deleted). We have a standard moderation policy, or we can produce a custom version for you. 3. You rest easy knowing someone is always watching over your virtual children. Additionally, at the end of every shift (each morning) an Australian team member reviews all content moderated, as part of our ongoing dedication to quality improvement. We switch on, so you can switch off. 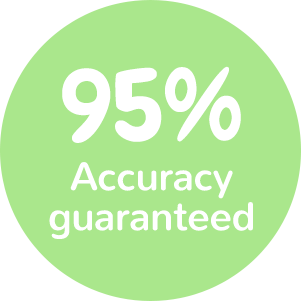 Our team will monitor, categorise and create alerts for your pages’ content with 95% accuracy guaranteed, even for very highly trafficked sites. 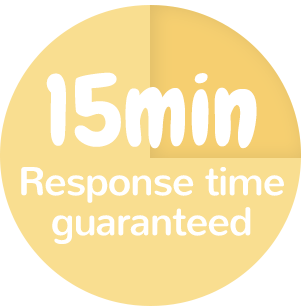 A response will be logged and issued on any content requiring immediate action within fifteen minutes of it being posted to your page. Quick notification guaranteed. Our moderation partners adhere to the strictest ethical standards. SocialSitter can offer our service at a low cost while also doing good. There are a range of plans available for SocialSitter depending on the hours you want monitored. We also offer a 'Pay as you go' plan for $13 per hour, and you can choose any hours you like. Prices displayed are in US dollars (USD). You can also choose to pay in AUD, NZD, GBP or EUR. Notes: Subscriptions are pre-paid monthly via credit card (Mastercard or Visa), bank deposit on request for After Hours plan and above. You can cancel your account at any time with one months' notice. 10% GST is charged for Australian customers, and 15% GST for New Zealand customers. For detailed pricing and terms, please contact us. To get started, fill out the form via the link below and we will send you a detailed quotation based on your needs. We can have you up and running within 3 days! Got questions? Great, we have answers. If you're on one of our 24/7 plans, public holidays are of course included. On our other plans, you can just request to have the public holiday added to your sitting schedule via phone or email for that week and you will be charged the applicable pay as you go rate. The content from your social media profiles is reviewed by a trained moderator, provided by our partner SamaSource. Samasource is a nonprofit organization whose mission is to alleviate worldwide poverty by connecting unemployed women and youth in impoverished countries with digital work, allowing them to earn a wage as determined by the Fair Wage Guide and to learn computer literacy skills to be employed in the broader workforce. Most of our contracts are month-to-month. If you want to stop using Social Sitter, just send us an email or phone us and we will cancel your account at the end of the month. If you've chosen to waive the setup fee and enter a 6-month contract with us, check the details of the contract for any costs that may be involved. We accept Mastercard, Visa and American Express in AUD, USD, NZD and EUR. For larger volume clients or on special request, we will accept payments by bank deposit or invoice. We bill each month in advance to allow us to provide the service at a low cost. Who can I speak to in an emergency? Social Sitter is not intended to be an emergency community management service. However, if you need emergency support -- whether it's community management help or advice on how to respond to a crisis, you can call the Dialogue Consulting emergency support line on 1300 852 662 (AU) or (567)-275-0547 (US) and we will help you straight away. Please note this service attracts a fee. How is this different to 24/7 community management? Social Sitter doesn't manage your community -- we do not respond on your behalf to questions, ReTweet or Like things, or otherwise engage with your community. By doing so, this allows us to keep our costs down. If you are looking for 24/7 community management, contact us and we can refer you to an appropriate organisation who can assist you. Unfortunately we can't offer a free trial period to be able to provide the service at such a low cost. However, if you're interested in using Social Sitter for a short period, you can use our 'Pay as you go' plan for as long or short as you'd like and upgrade to a monthly account at your convenience. International: +1 567 231 0271.
hello@socialsitter.io or use the form below. Who is behind Social Sitter? 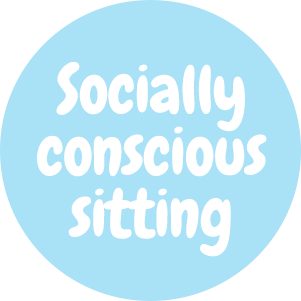 Social Sitter is a project made by Dialogue Consulting, who specialise in providing social and digital media strategy, risk management and advisory services. Based in Melbourne, Australia, we work with a large range of clients across many sectors and industries. © Dialogue Consulting 2013. All rights reserved.